UPDATED: Tue., Feb. 5, 2019, 10:39 a.m.
ARE, Sweden – One of the hallmarks of Lindsey Vonn’s career has been the way she bounces back from major crashes time and time again. So perhaps it’s fitting that the most successful female skier of all time will enter her last race before retiring following yet another tumble into the safety netting. Vonn straddled a gate mid-air during the super-G at the world championships Tuesday and ended up sliding down the hill face first. Vonn quickly got up after the fall and skied down the hill under her own power after being tended to by medical personnel. Then she sat and happily answered reporters’ questions during a half-hour news conference. The 34-year-old Vonn, the all-time leader in women’s World Cup wins, announced last week that she will retire after racing the super-G and downhill at the worlds – meaning that Sunday’s downhill is her final race. Vonn’s long history of crashes has included frightful falls at the 2006 Turin Olympics and 2013 worlds and injuries to virtually every part of her body – from a concussion to a sliced thumb to a bruised shin. But she has always bounced back by winning titles and medals. Vonn’s legs are so battered that she will have knee surgery for the seventh time soon after she retires – to repair the left knee ligament she tore during training in November. “I need complete reconstruction. That will be fun. Hopefully my last surgery,” Vonn said. Vonn was planning on retiring in December but moved up her last race upon realizing last month after failing to finish a super-G in Italy that her knees just can’t handle anymore pounding. She has discussed the long-term health risks for her body with her doctors. It didn’t take Vonn long to process on why she crashed. When she barreled through a gate, the panel fitted between the two poles detached and got stuck on her boots. When she hit the ground she slid downhill face first, using her hands to keep her head from hitting the snow, then came to a stop in the netting. “I had the right line coming in, that roll or jump had kind of a crown, it wasn’t exactly smooth and I think one of my skis hooked up and sent me into the panel,” she said. “The header into the fence wasn’t the best. Fernando Maddock, a 43-year-old fan from New York who traveled overseas to attend the championships, said watching Vonn crash was “heartbreaking. Vonn was wearing a safety air bag device under her racing suit, which inflated as she tumbled over and softened the impact when she hit the safety nets. On a highly technical course, many other skiers also failed to finish their runs. American teammate Laurenne Ross also crashed and of the 43 starters, 14 failed to finish. Mikaela Shiffrin won the race despite nearly making a similar error to Vonn toward the end of her run, correcting her direction in mid-air as she, too, was heading directly into a gate. 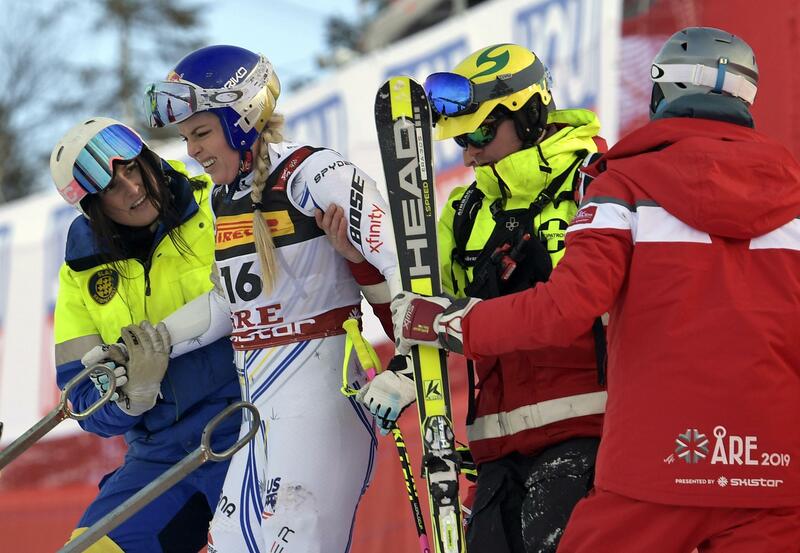 Upon seeing Vonn’s crash, Shiffrin looked away from the big video screen in the finish area. Sofia Goggia, who took silver, clasped her helmet with both hands, and the crowd gasped. One American fan appeared to be crying. Published: Feb. 5, 2019, 9:07 a.m. Updated: Feb. 5, 2019, 10:39 a.m.